Apple laptops have traditionally been popular with both students and faculty at colleges and universities, but evidently the recession and the netbook phenomenon are taking their toll on Apple's competitiveness this back-to-school season. "While Apple has done well historically in the education market, 2009 marks the dawn of the netbook," commented Retrevo's CEO Vipin Jain, "Students told us they wanted longer battery life, smaller size, and a lighter laptop. 58% of them plan on spending less than $750. All but 18% have a budget over $1,000. Netbooks are affordable; some costing only $170. In contrast, Apple laptops start at $949. At a time when many people are experiencing economic hardship, having a new Apple laptop isn't a necessity." Inarguably true, but I would still contend that Apple 'Books represent the best long-term value for money spent, not to mention user experience, and that the 13" MacBook Pro offers something special for a historically very attractive price in the Apple context - albeit $350 more (education pricing) than that arbitrary $750 threshold. The MacBook White however, only exceeds that cutoff by $200, and it's well-worth digging a little deeper for if you can possibly manage. For students with the good taste, appreciation of quality and long-term value, and flush enough wallets to buy a Mac laptop, my friend and former Applelinks colleague The Mac Observer's John Martellaro this week posted a timely and helpful guide for students planning to take a new MacBook to college this fall, with tips and mini-tutorials on transporting, backups, and security. John suggests that a good portfolio/messenger bag or purpose-made computer backpack with a dedicated, well padded or armored soft-lining pouch for your MacBook (or other laptop) should be considered a priority. You can find reviews for various laptop cases and backpacks in the 'Book Value archives and the Miscellaneous Ramblings review archive. Another protective alternative if you prefer to travel light with your laptop is a plastic shell that attaches snugly to the MacBook. They come in various colors or clear plastic. There are several brands of these available. I recently reviewed the Uniea Haptique Hard Shell Case on PowerBook Central. It's a good example of the genre. The Haptique is available for Unibody 13" MacBooks and MacBook Pros, offers excellent protection from dings and scratches, and adds very little weight. The Speck SeeThru is another example of this sort of shell case. One point on which I take minor issue with John's commentary is where he says the 13" MacBook Pro is two pounds heavier than the MacBook Air. Actually, Apple's smallest Pro 'Book weighs only 4.5 pounds, as opposed to the MacBook Air's 3.0 pounds, making the new Pro even lighter than the legendary 12" PowerBook G4 (4.6 lb.). I do agree with John that every pound counts when you're lugging a laptop around all day, so even a 1.5 lb. difference is something to carefully weigh in your mind, but IMHO the MacBook Pro's vastly greater power, connectivity, and expandability - all areas of deficiency with the MacBook Air - not to mention its substantially lower price, make the Pro the wiser and better value choice, especially if it's going to be your main or only computer. Other tips in John's article include purchasing a Kensington lock that can secure your MacBook to a desk or something solid while you're away, which I agree is an excellent suggestion, as is his advice to get a second AC adapter - one for your work desk and another for the computer case or in the backpack will be a convenience you'll thank yourself for many times over. Then there's the crucial importance of file backups, which should be a priority whether you're a student or not. Loss, theft, fire, damage, or simple mechanical failure can wipe out your vital collection of files, contacts, music, photos, and so forth in an instant, and it could all be gone irretrievably if you don't have a backup and keep it up to date. This .dmg file will be backed up along with all your other files as part of the Time Machine backup process. If, for some reason, it ever becomes corrupted and unreadable, you have the security of being able to go back in time until you find a good version. It's probably not a good idea to keep private files - not even inside an encrypted .dmg - on a flash drive on your (real) keychain with car keys, etc. The daily wear and tear, exposure to impact, bending, and possible loss just put the data at more risk, and you may forget to routinely back it up. John also recommends making sure your MacBook is insured against theft or loss (this may be possible with a personal articles rider on your parents' home insurance policy, as it was for my daughter's 'Books when she was at university). Retrevo has released a new online laptop catalogue that includes links to the best deals on MacBooks, as well as other make notebooks, and now includes an exclusive section for students. "Retailers are working overtime to attract students," observes Jain. "The problem this year isn't finding deals; it's finding the best product for your budget. Retrevo can help." Retrevo has also introduced a Twitter shopping service giving in-store laptop shoppers a second opinion. 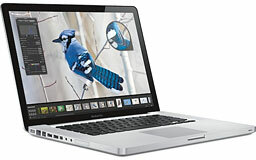 Low End Mac's Best 13" MacBook and MacBook Pro Prices, Best 15" MacBook Pro Prices, and Best MacBook Air Prices are updated regularly with prices on new, demo, Apple refurbished, and used notebooks. Mac laptops are more expensive than the mainstream run of PC laptops and a lot pricier than even the highest-priced netbooks, but you do tend to get what you pay for. Over the years, I've met very few Mac users who wished they'd bought a PC instead. * The worldwide installed base of Macs is 5.2% that of Windows, so even if only one-third consider a Mac, it bodes well for Apple. Mac notebooks are very well represented on most college campuses. ** A bootable backup, which can be created with Carbon Copy Cloner or SuperDuper, can get you back to work even faster than restoring from Time Machine.